While people may disregard Trump’s memes as playful and harmless, the fact remains that Trump got away with making some of the most unprofessional statements ever made by a presidential candidate. Dating back to the 18th and 19th centuries, political cartoons have served as illustrations or comic strips that contain a political message that usually relates to current events or personalities. Additionally, the high rates of illiteracy amongst the public were estimated to have been the most influential factor in the increase of political cartoon creation and distribution. On a slightly similar note in today’s digital age, politically infused ideas have extended into other forms of expressions such as user-generated internet memes. In his 1976 book titled The Selfish Gene, the term “meme” was originally defined by biologist Richard Dawkins to reflect a unit of imitation or learning of culture (as cited in Wisniewski, 2011, p. 169). Going further down the timeline, Shifman (2014) tries to redefine memes within the field of communications, stating that internet memes are a “collection of texts that are circulated, imitated, and/or transformed via the Internet and social media by many users” (p. 56). 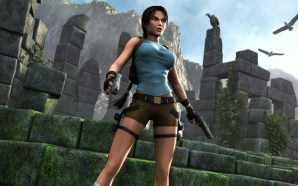 Of the many different kinds of internet memes–from video to photo, gifs to commercials, or even certain skits on “Saturday Night Live”–the meme style that is probably most identified would be image macros, which according to a website called Know Your Meme, is defined as containing a captioned image with a catchphrase of some sort. Given this definition, we can refer to the first meme as a politically infused “image macro” meme created and shared on the internet. Through various free meme generators and record high rates of active internet users, we can presume that internet meme culture through social media is more accessible than ever. In all realms of politics, especially the most recent 2016 presidential election, countless memes emerged that reflected different political realms and beliefs. The range of memes have been evident on multiple sides of the political spectrum, reflecting various messages. Some recent meme examples include the Obama/Biden memes which served as comic relief, portrayals of pepe the frog as an occasional alt-right supremacist symbol, Jill Stein dank meme stash, Sassy socialist memes, and Bernie Sander’s dank meme stash. Interestingly enough, however, Wisniewski also contends in his chapter “It’s All About Meme” that “ideas as ‘memes’ [that] are passed along in public discourse make for effective pedagogical tools that expose students to a wide variety of themes and topics that they may or may not have been aware of” (as cited in Kolluri, 2016, p. 219). Although Gray, Jones, & Thompson argue that people from different political realms are relaying messages in similar aesthetic ways whereby “comedy [is] becoming political and politics becomes funny” (as cited in Kolluri, 2016, p. 217), there is little research on the communication of ideas specifically involving memes and the roles they played throughout the election to present. Additionally, in the instances where there is no pedagogical “lesson” or deeper meaning found within a meme, memes that are politically embedded (regardless of political standing) can easily serve as devices aimed to attack particular groups of people. What is important to distinguish, however, is the different ways in which these “dememeing” memes are being used by different parties. 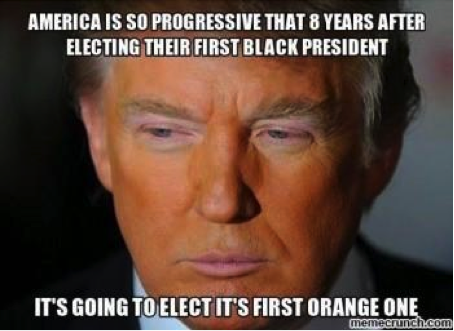 With that being said, it may be relevant and appropriate to shine a spotlight on the tone of pro-trump meme culture. It would be misleading to assume that Pro Trump/Anti-Hillary memes are the only ones capable of reflecting surface-value communication and oversimplifications, and we know this through a simple Google image search. Additionally, regardless of political party, all of the memes shared throughout the election tended to express “a very partisan opinion” according to Craig Silverman, fake news expert at Buzzfeed in an interview with NPR. In his analysis, Silverman found that sharing of misinformation related the election demonstrated that memes were one of the two categories of content that performed “really well” in terms of share count and site traffic. Additionally, his analysis has demonstrated that “pro-Trump misinformation and anti-Clinton misinformation far outperformed anything that came from the other side” (NPR, 2016). Although the proliferation of these hyper-partisan political memes is much higher now than they were four years ago, Mr. Marc Schwerdt, assistant professor of political science at Lipscomb University, explained how creation and distribution of memes will most likely enforce what people already believe instead of changing actual beliefs. Parallel to the narrative of Trump supporters verbalizing their frustrations over “political correctness,” it is safe to say that internet meme creation and sharing is providing another platform for political intimidation to occur. Despite estimates on the potential spike in hate crimes after Trumps declared win, it is important to re-iterate that not all Trump supporters are racist, sexist, Islamophobic, etc. 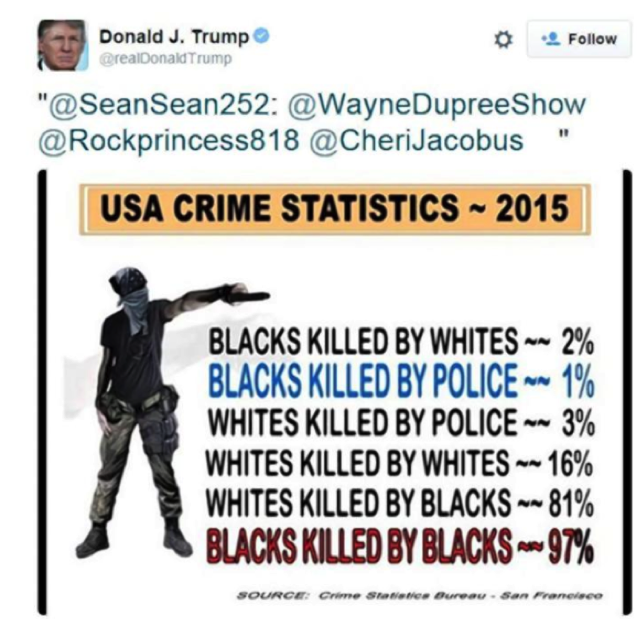 However, with studies suggesting that racist Americans are more likely to be Republican than any other party, we can confidently assume that internet memes containing subtle and overt tones of sexism, racism, Islamophobia, hatred, and other prejudice have a larger margin to be expressed by Trump supporters. When analyzing some of the memes that Trump personally tweeted (which were retweeted, liked, and replied to by thousands), we can guide this assumption with more confidence. 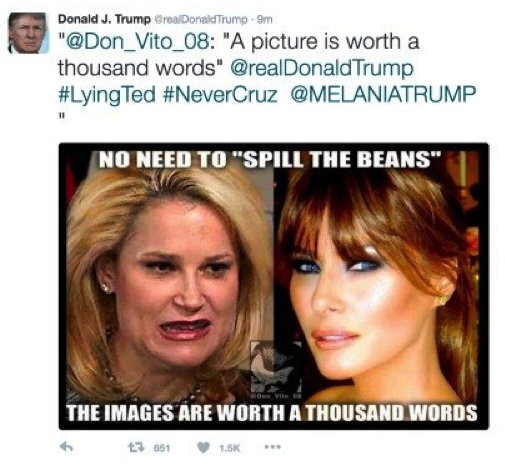 Herein are examples of the Trump meme tweets, which hyperlinked images to the articles behind each original post. While people may disregard Trump’s memes as playful and harmless, the fact remains that Trump got away with making some of the most unprofessional statements ever made by a presidential candidate. Undoubtedly, Clinton has had her fair share of “slips,” but Trump’s meme sharing was personally and politically contrived. What is additionally troublesome is the fact that he still won the election even after making such comments. Why was this the case? As illustrated earlier in this post, Pro-Trump and Anti-Hillary content seemed to have performed better on social media than any other group. Had it not been for Trump’s history of Hollywood years where he eventually learned how to “tap” into the minds of Americans, he might have been less successful in being the media spectacle and walking, talking meme-generator that he is today. Moreover, Trump had more followers on twitter than Clinton, which weighed around 17.4 million (in comparison to Clinton’s 11.6 million followers.) By looking at the popular vote results (where Trump lost), it’s clear that not all 17.4 million of his followers were in his camp; however, a sizable number of anti-trump followers tuned into his message, even if only to be amused by what he has to say. 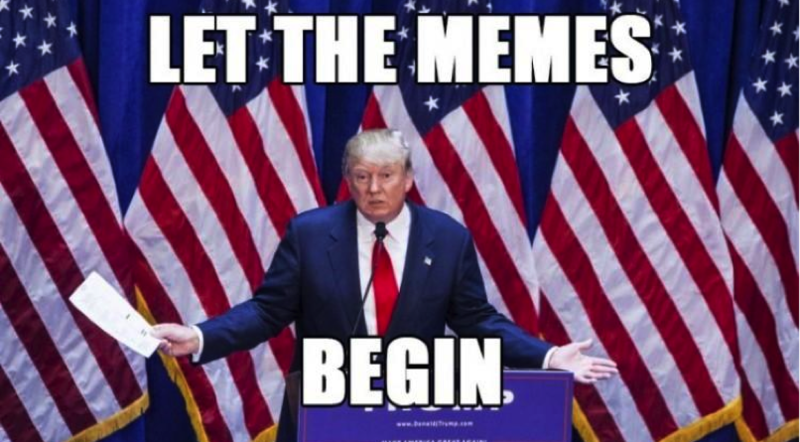 Although many Trump supporters, post-election, are going to continue using memes in unproductive and aggressive manners, general participants in meme culture with basic concepts of political media literacy must do their part by doing more than sharing and creating hilarious memes about it. As Silverman observed, Pro-Trump memes performed better than Anti-Trump memes, which means that Trump has the upper hand in gaining audiences and wielding his propaganda. Beginning in January 2017, those engaged in U.S. politics will need to carefully consider their role in sharing and validating news and memes that may also impact their friends and followers. Memes are more than innocent tools for comedic purposes. In fact, the use of them and their various consequences are the heart of contemporary politics. 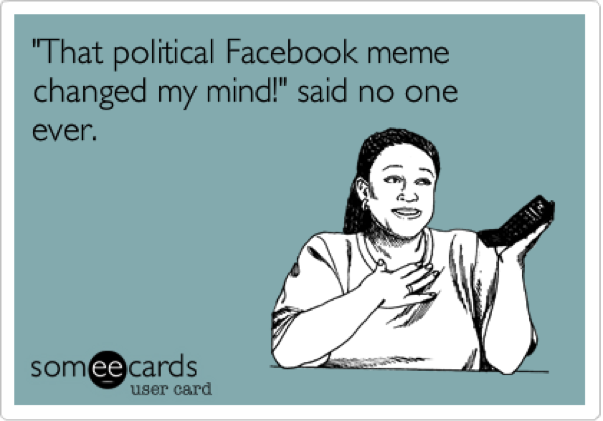 Political memes primarily serve as entertainment tools instead of factually based news gathering and news validation in the social media world. In addition to the prevalence of false equivalencies that emerge from memes, social media promote the over-simplification of ideas. As Bill Yousman (2016) explains, “Images are not readily subject to critical thinking unless we set out specifically to analyze them —which most of the time outside of the classroom we do not” (cited in Frechette & Williams, p. 162). Given that internet memes reduce complex ideas into visuals and pithy text, meme sharing can lead to slacktivism, which is defined as essentially a way to engage in politics without fully engaging or being committed to the political process. As put forth by Christensen and other scholars, online digital activity “can be seen as simply enhancing the “feel-good factor” for participants (as cited in Jaffe, 2016, p. 107). More specifically, as proposed by Shifman (2014), “By creating original memes or remixing existing ones, they are able to both express themselves, fulfilling their self-expression needs, and belong to the larger community of meme consumers; in this way, they display a “networked individualism”, being “themselves, together” (p. 34). The caveat is that these displays of and exposures to imagery that reflect surface-level or reduced thinking (with all parties guilty) do not always provide the most logical pathways into deeper and fact based conversations about politics. Although memes do not necessarily change people’s political beliefs, there can be divisive, while reinforcing political agendas. So how do we get through both the anticipated wave of political memes to come? That depends on how immersed you currently are in internet meme culture. Whether you are a creator, content relayer, viewer, or a hater, we all have roles to play when it comes to acting as agents of social change in a digital age. Although “social change” may have different definitions for different people, memes can be used as simplistic and divisive tools when they are unbiased and support no textual evidence to further pursue. 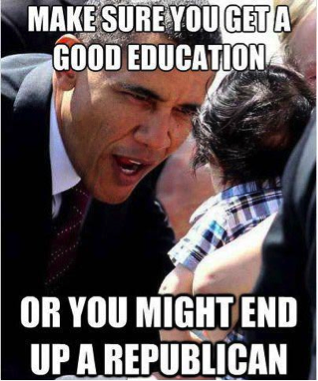 The following memes serve as an example for decoding political memes through a critical media literacy lens. First, when coming across a meme such as this one it always helps to identify the familiar faces or symbols that are denoted. For political memes in which you do not recognize the face, try using the textual clues provided. 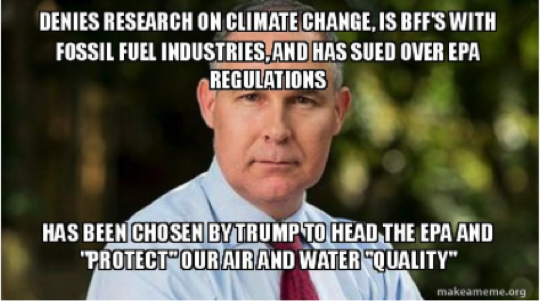 In the meme posted above, although you may not know who this man is based on what he looks like, there are researchable terms, such as Trump’s nominee for “Head of the EPA.” The preliminary results of a Google search will yield the name Scott Pruitt. 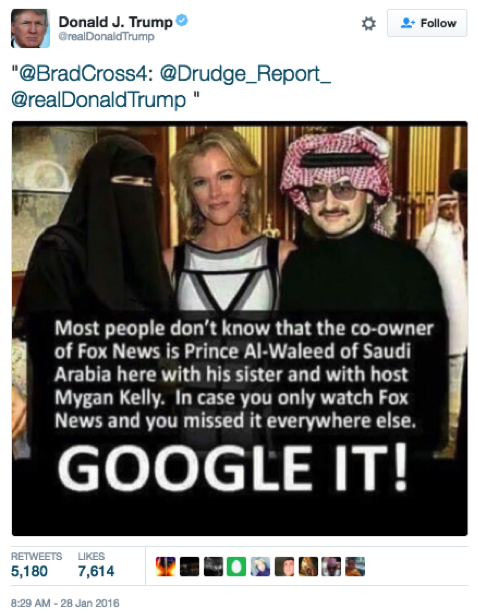 Soon after finding vetted and independent sources, you should seek to find out whether or not the claims in the meme are true, keeping in mind that it will most likely take more than one article to get there (Note: the claims are true in this case, although the “Bff’s” may be a slightly exaggerated take on “close ally”). The caveat here is that if you did not know who Scott Pruitt was before seeing the meme, you probably did not laugh as hard as those who do know. After all, “Good comedy should involve some effort and knowledge on part of the audience” (Friedman, 2014, p. 69). Similarly in an interview with Stephen Colbert on his satirical talk show, he claims that audience members miss “half our joke if they do not keep up with up with the day-day changes of mass media news” (Kolluri, 2016, p. 217). If you are not the type of digital native to go outside of social media to find the deeper meaning or factual substance to support (and, according to Yousman, you probably are not) you can either look for other clues outside of the meme, or you can create a meme yourself. (For some quick tips on how to create a meme that can “go viral,” check out this link!) Although this specific NPR article does not mention memes specifically, there are still some helpful tips to follow in this age of fake news being spread. The comment section, for example, can feature all kinds of reactions, and many of us enjoy political arguments on Facebook. Yet, if we do not “do our part” in executing our own research outside of social media outlets, then memes, headlines, images, and stories are going to continue to hold and communicate information that is politically formative. Although memes may seem like they are innocent images with text, more often than not, they are keeping us from having important conversations beyond pithy and humorous tropes. Is it our fault for having varying political literacies while being engrossed in meme culture? Or should we blame the “highly commercialized and fragmented media instead for presenting a ‘dumbed down’ version of news in the form of infotainment?” (Kolluri, 2016, p. 214). Even when memes are used as tools to introduce meme viewers and social media users to important themes within the political season, not everyone has the same “literacies.” Although memes are similar to news headlines in the sense that they are both prone to being written in exaggerated yet simplified language, news headlines often have stories attached to them, whereas memes have stories attached in less direct ways which require outside research. These clues, along with context clues within the frame of the meme, are just a few of the steps to become a critically aware citizen in the digital age of meme expression. 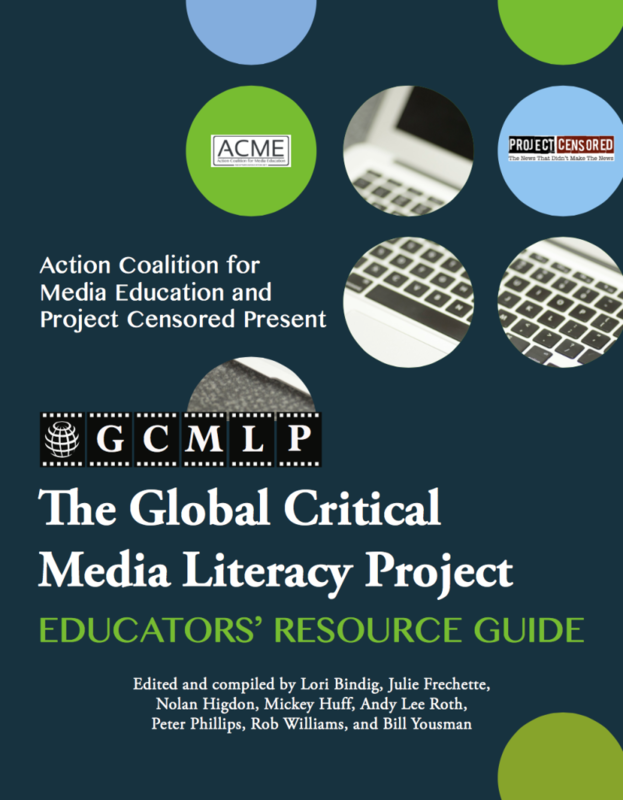 Media literacy can help us become more aware of the political landscape around us, and in turn, help us distinguish media propaganda and profit-driven messages from factual information. There is no turning back from an image-based culture, especially in the digital age, so from a media literacy perspective, critical approaches are necessary to combat the effects of appealing to the lowest-common-denominator so prevalent among social media. Politicians and politics are being simplified to appeal to surface-level thinking, with the end result leading to the spread of slacktivism or cynicism. In this age of fake news which can spread like wildfire without any merit, media literacy is especially crucial. Frechette, J. & Williams, R. (2016). Media Education for a Digital Generation. New York: Routledge. Friedman, S. (2014). 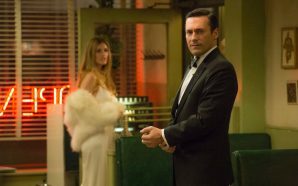 Comedy and distinction: the cultural currency of a ‘good’ sense of humor. 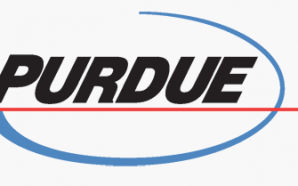 London: Routledge, Taylor & Francis Group. Jaffe, M. (2016). Social justice and LGBTQ communities in a digital age: Creating virtual and social affinity spaces through social media. In J. Frechette & R. Williams (Eds. ), Media education for a digital generation (pp. 103-119). New York, Routledge. Kolluri, S. (2016). Humouring youth into political engagement through The Daily Show and The Colbert Report. In J. Frechette & R. Williams (Eds. ), Media Education for a Digital Generation (pp. 208-220). New York, Routledge. Shifman, L. (2014). Memes in digital culture. Cambridge, MA: The MIT Press. Wisniewski, K. A. (2011). It’s all about meme: The art of the interview and the insatiable ego of the Colbert bump. In The Stewart/Colbert effect: essays on the real impacts of fake news (pp. 164-180). Jefferson, NC: McFarland & Company. Yousman, B. (2016). The text and the image: Media literacy, pedagogy, and generational divides. In J. Frechette & R. Williams (Eds. ), Media Education for a Digital Generation (pp. 157-171). New York: Routledge.